The Village of Downs is in McLean County, IL located between US 150 and I-74 in the Bloomington-Normal metropolitan area. Lying roughly eight miles southeast of town, Downs boasts a popularity because of its small-town peacefulness, friendly and welcoming neighborhoods, wooded parks and quality education. It is the best of both worlds when looking for a small community life that is still within an easy and quick drive of the city’s amenities. Downs is easily one of the most requested rural areas for information and showings. We have a request nearly daily and for the village are always happy to share what Downs has to offer with our clients. The education system is top-notch, as children attend the Tri-Valley District. Tri-Valley Schools attract many families to move to Downs with their small town feel with bigger town educational resources. When children are not in school, families are often found exploring some of the recreational areas located nearby: Clinton Lake State Recreational Area, Moraine View State Recreational Area, Allerton Park or Weldon Springs State Park. We know that one of the biggest desires of someone looking to move to a small town, is the sense of safety and community within the area. The village offers several events to their residents throughout the year that are run by volunteers and funded by donations or sponsors. There are car shows, movies in the park, 5k runs, fright fests, fireworks and many more activities. Here you can view the entire Down’s schedule of events. 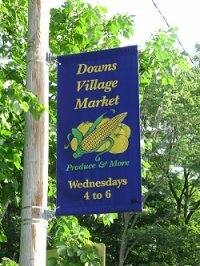 One of our favorite traditions is the Downs Village Market that takes place every Wednesday evening from June through September. The vendors offer seasonal produce with exceptional quality and taste. Be sure to check out the tomatoes, sweet corn and other fruits and vegetables while enjoying the live music! If you’re under the impression that the real estate market in Downs consists mainly of old farm houses, you’re wrong! There has been a tremendous amount of new construction and development over the last 15 to 20 years with new homes still under construction as well. You can find some of the most beautiful homes near Bloomington-Normal here. The homes currently listed have a price point that ranges from the mid $100,000’s up to close to $1,000,000 and they don’t stay on the market for long. The larger homes tend to sit on larger lots and have upgrades that you need to see for yourself. For you, if you are looking to join a small community, price point really isn’t a limiting factor in Downs. Don’t allow someone else to come in and steal your dream home in one of our favorite small towns! Give us a call right away and let’s chat, 309-310-6030.